We will all have experienced the feeling of having too much to do and insufficient time in which to do it at some time or another and having to rush to try to get things accomplished is a sure-fire way to add additional stress to your life as well as increasing the likelihood of you making mistakes and even accomplishing less so it’s important that you learn how to manage your time effectively. 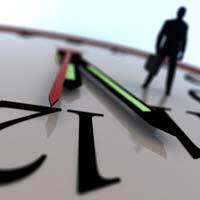 There is no one solution to the problem of time management as we’re all different with different motivations and preferred methods of doing things but there are a few basic tips which could be modified to suit and, by following these, you’re likely to find that you work far more productively and encounter less stress. Whether it is at work or at home, we’re often faced with a multitude of tasks to complete within a set period on any given day. And, if you simply view your day as one gigantic ‘task’, then that’s enough to put you off achieving anything as you’re likely to feel overwhelmed at what you need to accomplish. Therefore, having either an online or desk diary or daily planner is far better as you can break down all of your tasks into smaller, more manageable chunks. It’s also crucial to remember that the demands on our time seem to be increasing all the time and especially at work. Therefore, it’s important to be realistic about what you can achieve in any given day and the best way of doing this is to prioritise all of your workload and then allocate a set amount of time to achieving each task in the order of its importance. Once you’ve done that, it’s then crucial to stick to that schedule and not to get diverted. If you do find that you’ve stuck to a schedule and yet there are still priority tasks left on the list, then if you’re in a position where you can delegate certain tasks to others, maybe you’ll need to consider that. Alternatively, you might need to have a chat with your superiors to re-evaluate what is and isn’t realistic in terms of their expectations. Once you’ve scheduled your priorities, stay focused. It’s so easy to get diverted by small talk and other distractions. Take e-mail for instance as this is a prime example. If you’re working at a computer, no doubt you’ll have a sound alert to tell you when you’ve received new e-mail. Now, unless you have a job where you always need to respond to e-mail quickly, turn off your alerts (or your e-mail entirely, if possible) and simply set aside some time each day where you’ll deal with e-mail and then only deal with it in the allotted time. Quite often, whether it’s e-mail or some other kind of ‘interruption’, by diverting your attention to something else, it can then be quite hard to get back into the groove of what you were doing which then means lost time which you’ll then feel pressurised into making up later. Therefore, work diligently on each task one at a time and it’s perfectly acceptable to take a 5 or 10 minute break before the next task if your company allows it, in order that you can then come back refreshed and ready for the next task on your list of things to do. Procrastination is probably the biggest enemy to effective time management. So, once you’ve got your schedule sorted, stick to it. Remember, putting off something which you know you need to do only makes it become even more overwhelming and difficult to face so tackle it head on. Some people find it better to get all the most difficult and least enjoyable tasks out of the way first at the beginning of the day, leaving them with only the more pleasurable ones left to do later. This doesn’t work for everybody however. What’s important is that you work out when your ‘prime time’ is, perhaps it’s after your lunch break, for example and then tackle those more complex, less enjoyable aspects of your work then if you can when your energy levels are at their peak. One of the main ways you can learn how to manage your time effectively is to keep a written record of everything you do throughout the day - i.e. what it is you’re doing, how long you were doing it for and at what time of the day did you do it. Account for absolutely everything - even idle chat. If you then go back and analyse that, you’ll be amazed at how many minutes you’ve spent on non-essential issues and by restructuring that, you’ll often find you’re easily able to accomplish all you need to and still have spare time for yourself.